Derek Hasted conceived the idea hago in late 1998. hago started rehearsing in February 1999, and Derek took up the role of Musical Director, which encompasses arranging (and in the early days) conducting. Derek now plays alto guitar in the orchestra. Although Derek is a Kentish Man, he has been teaching guitar in Hampshire since 1977. His structured beginners' syllabus was the first in the country to be accredited by the Open College Network. He has a Master's degree from Peterhouse, Cambridge and a Teaching Diploma from the Associated Board of the Royal Schools of Music (ABRSM). Derek is a prolific arranger of accessible guitar ensemble music, with many publications in print. 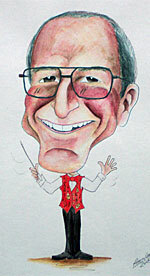 His works include Tiny Trios (for beginners) and Diff'rent Dances (Grades 2-4) - amongst his publisher's Best Sellers. You can see, hear and order these and his other ensembles in The Shop. His ensemble compositions & arrangements are part of many School and Guitar Society concerts in Britain and overseas - popular with young and old guitarists alike. His solo suite "Celebration" is recorded on CD and is performed by guitarist and dear friend Bruce Paine. Derek has completed commissions for ABRSM's innovative Music Medals scheme for novice ensemble guitarists and received a "We Can Do It Award" from the Portsmouth News in recognition of his teaching and fund-raising. He is a music reviewer for Classical Guitar magazine, which occasionally calls him Derek Halstead, just to keep his sense of self-importance in check. Derek also plays brass, piano and a number of other stringed instruments. This breadth of musical experience means that hago enjoys a sound which draws on much more than hackneyed guitaristic motifs and patterns, and Derek isn't afraid to arrange music that is not normally placed on guitar. Derek offers guitarists two ensembles to join - look here for details. Find out more about Derek (and his sense of humour) at his Guitar Ensemble website.